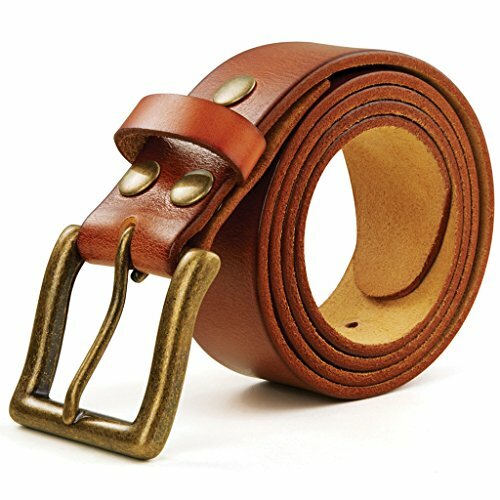 100% COWHIDE:Beautifully packaged belt is specially produced for men. Made of 100% first layer cowhide ,stylish and durable. Sincerely,it will accompany you for a long time..
ADJUSTABLE SIZE:Man belt set without any addition to try the best to keep the original surface with flexible texture, durable and firm, which will never break in normal using. There are 4 sizes to choose: 32-34, 36-38, 40-42, 44-46. 7 holes, the distance between hole and hole is 1 inch that can be freely adjusted to the appropriate position. BASED ON YOURSELF:Belt for man is 1.5 inches belt width, flexible buckle design, you can replace your favorite buckle according to different dressing. And 2 in 1 buckle design, really suitable for needle buckle and plate buckle. EXQUISITE PACKAGING:Leather man belt is really a perfect gift choice,both of your family and friends. AFTER-SALES SERVICE:Cost-effective, pursue worth value for the money and perfect customer experience. 1 year guarantee, if you are not satisfied with our products, we promise to return or refund within 1 year.